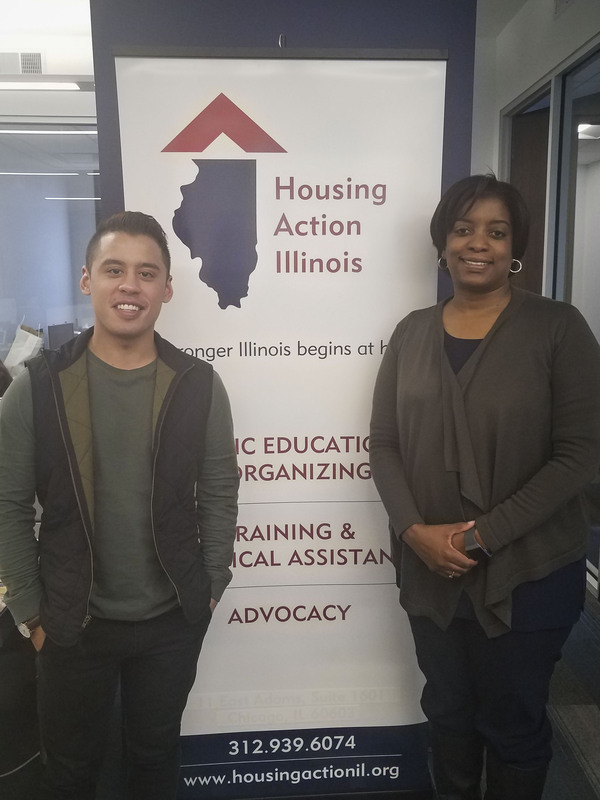 Housing Action Illinois has come a long way since we hired our first full-time staff member in 1988—a single employee who shared our offices with the Lawyers’ Committee for Better Housing. Today, we have 14 full-time staff members, and we’ve grown so quickly that we needed to move to a larger office at 67 E. Madison Street. Since August, we’ve welcomed two new team members: Timm Krueger and Wanda Collins. Timm Krueger is filling a new role for Housing Action Illinois: Marketing and Communications Consultant. His career started at a small property management company in Peoria. From there, Timm found his calling as Community Relations Manager for the Peoria Housing Authority (PHA), where he helped shape agency-wide policies and improve PHA’s relationship with its residents and the community at-large. After relocating to Chicago in 2015, he spent two years as a Senior Marketing and Communications Associate at SmithBucklin, developing advanced experience in email, social media and website marketing. As our Marketing and Communications Consultant, Timm works one-on-one with Foreclosure Prevention Program-Graduated (FPP-G) grantee organizations to effectively promote their programs and services to their community. Wanda Collins, meanwhile, is joining Bibian Cristino and Jennifer Pallas as Housing Action’s newest Capacity Building Specialist. Wanda brings more than 15 years of experience in the mortgage and housing industry to her position. She started her career in loan origination and mortgage underwriting before moving into foreclosure prevention counseling. Most recently, she served as the Manager of Homeownership Services at Neighborhood Housing Services of Chicago, where her team provided an array of housing counseling services. Housing Action’s Capacity Building Specialists work with our Director of Technical Assistance to coordinate and implement our training and consulting program, which helps housing counseling agencies and housing developers build their capacity through workshops, one-on-one support, direct technical assistance, and working groups on key issues. Both Timm and Wanda emphasized that their previous engagement with Housing Action Illinois drew them to apply for their positions. About 2 days ago from Housing Action IL's Twitter via Hootsuite Inc.